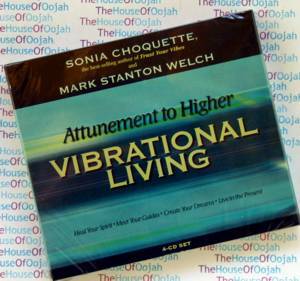 Brand New 4 CDs : This remarkable four-CD set has been channeled by six-sensory revolutionary teach and healer Sonia Choquette and singer/songwriter/sound healer Mark Stanton Welch to help you align your internal energetic vibration with your greatest desires. Listening to these CDs will immediately raise your personal vibration to a higher level, connect you with your spirit guides, free you from past karmic patterns of negativity and dis-ease, and enable you to achieve all that you dream of. Sonia Choquette is an internationally acclaimed spiritual teacher, intuitive guide and masterful catalyst whose special gift is to energetically activate the highest vibration and free the authentic Spirit in everyone she meets. She releases people from the restriction and fear of the ego and guides them through the portals to joy, wholeness, and personal empowerment in every area of their life. She has also been a personal Intuitive advisor to such New Age Leaders as Louise Hay, Julia Cameron, Caroline Myss, Dr. Wayne Dyer, pop icon Billy Corgan of the Smashing Pumpkins rock band, and professional consultant to international business leaders such as Charlotte Beers, Fortune 500 Company CEO. A third generation intuitive and prolific writer, her books have sold over a million copies worldwide including her NY Times Bestseller The Answer Is Simple.... Love Yourself, Live Your Spirit. Highly trained and apprenticed in both the Psychic Arts and Metaphysical Law, Sonia was educated at the University of Denver and the Sorbonne in Paris. She then pursued a spiritual education at the American Institute of Holistic Theology www.aiht.edu resulting in a BA, MS and PhD in Metaphysics Her best education, however, she insists is her over thirty five years of working “in the trenches” consulting directly with people, and reading for them one-on-one, all over the world. Her book Your Heart's Desire is currently required reading at the University of Santa Monica and her book The Wise Child was a featured topic at the first International Conference on Children's Spirituality in Atlanta, sponsored by the University of Atlanta. Sonia is passionate, dynamic, powerful, and direct in her ability to instantly liberate people from the limitations and fears (a five-sensory life) and leads them to create a far more effective, spirit guided (six sensory) successful life which she insists is “our natural way.” Using her highly developed, finely tuned intuitive skills she can instantly identify self sabotaging patterns and life obstacles and guide people past them and directly onto success in all their goals. No-nonsense, to-the point, practical, down–to–earth, and often hilarious in her delivery, Sonia’s intuitive gifts and engaging Spirit inspire even the most cynical. There is no doubt about it; to meet Sonia in person is to change your life. Sonia has been a regular guest on ABC, NBC, CNN, FOX, Lime, Sirius, and WGN as well as featured in New Woman Magazine (where they rated Your Heart's Desire as one of the 10 best courses to change your life), New Age Magazine, USA Today, Body and Soul, Chicago Tribune, Chicago Sun Times and Crain's Chicago Business Journal.